Swill Brook Basin is a place on the waterways minor waterways place place on the waterways major waterways place village town city on the Lancaster Canal (Main Line) between Ribble Link - Lancaster Canal Junction (5 miles and 6 furlongs to the southeast) and Lodge Hill Junction (Junction with Lancaster Canal - Glasson Dock Branch) (16 miles and 6¾ furlongs to the north). 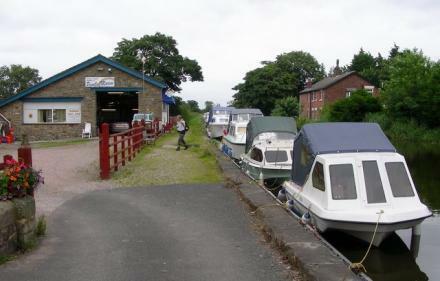 The nearest place in the direction of Ribble Link - Lancaster Canal Junction is Swill Brook Bridge No 32; ¼ furlongs away. The nearest place in the direction of Lodge Hill Junction is Woodplumpton Aqueduct No 33; 3 furlongs away. The winding hole is in the direction of Woodplumpton Aqueduct No 33. Far Furlong, Blackleach Lane, Preston, PR4 0JA — 871 yards to the west. Willacy Yard Bay Horse Lane, Catforth, Preston, PR4 0JD — 1435 yards to the northwest. Catforth, Preston, PR4 0HH — 1597 yards to the northwest. Harrison house Benson lane catforth, Preston, PR4 0HY — 1224 yards to the northwest. Unit 4 Bartle Court Business Village, Rosemary Lane, Preston, PR4 0HF — 518 yards to the south. Blackleach Farm, Roots Lane, Preston, PR4 0JB — 1014 yards to the west. Preston, PR4 0JB — 1281 yards to the west. Preston — 902 yards to the northwest. Catforth, Preston — 957 yards to the northwest. 12a Bartle Court, Rosemary Lane, Bartle, Preston, PR4 0HF — 910 yards to the south. The Office, Swillbrook Lodge, Bartle., Preston, PR4 0HB — 454 yards to the south. Crown Lane, Preston, PR4 0HD — 277 yards to the southeast. Preston — 1615 yards to the northwest. Preston — 1281 yards to the west. Preston — 574 yards to the southwest. 2 Willacy Yard Bay Horse Lane, Catforth, Preston, PR4 0JD — 1575 yards to the northwest. Preston — 1004 yards to the west. Brookfield Rosemary Lane, Preston, PR4 0HB — 505 yards to the south. 2 saddle fold court, catforth, Preston, PR4 0EA — 957 yards to the northwest. Preston, PR4 0T — 1629 yards to the northeast. Preston — 910 yards to the south. Pepper Hill Farm, Roseacre Road, Salwick, Preston, PR4 0SD — 1476 yards to the southwest. Catforth Village Hall, Catforth Road, Catforth, Preston, PR4 0HH — 1188 yards to the northwest. Field and Garden Flowers, Catforth Road, Catforth PR40HL, Preston, PR4 0HL — 1181 yards to the northwest. Catforth, Preston, PR4 — 957 yards to the northwest. Willacy Cottage, Benson Lane, Catforth, Preston, PR4 0HY — 1559 yards to the northwest. Catforth Rd, Preston, PR4 0HH — 1188 yards to the northwest. 1278 yards to the northwest.